Why is food on a stick so fun? I don't know but it is. On A Stick! on sticks....gee Chris, you're so clever....not. On A Stick! is more than a collection of shish kebab recipes. It is an exploration of party foods on a stick, both sweet and savory. Of course, there are the more traditional satays and yakatori. But there are also unexpected items like Spaghetti On A Stick and Chicken and Waffles. The line up of sweet stick foods will surely blow you away. Chocolate covered cheesecake on a stick? Check! Deep Fried Candy Bars? Yep. Red and White Sangria Pops? Yes, please! Matt presents the recipes from the perspective of entertaining guests. Each recipe includes a full page, stunning photograph that gives you a flood of ideas on how to serve party food. Matt shows small little styling tricks that make the food pop off of the plate with color, texture, and flavor. If you are doing any food entertaining this summer, On A Stick! will give you everything you need to know to create the perfect tasting menu. The two things I like best about this book are it's variety of cooking techniques and it's inspirational nature. For stick food, it would be easy to be 100% about grilling, right? But no. On A Stick! balances grilling, deep frying, freezing, dipping in chocolate (yes, that counts as a cooking technique), and using fresh raw ingredients. While the recipes are solid and easy to follow, this is also the kind of book where you can thumb through it for 15 minutes, put it down and go make something similar inspired by things you saw in the book. For example, I made this easy recipe based on several recipes from On A Stick! inspired by On A Stick! In a small sauce pan, heat the vinegar, sugar, and jelly until the sugar is dissolved. Add the garlic, Sriracha sauce, and mirin and simmer for 5 minutes. Whisk the cornstarch and cold water together. Add into the sauce mixture, whisking until thickened to a sauce consistency. Remove from heat, add the cilantro and let cool for 1 hour. Set up your grill for direct grilling over high heat. Here I am using a highly technical method taught by Neil "Big Mista" Strawder on the Ultimate BBQ Showdown on CBS last weekend. "I'm putting this charcoal in a geometrical shape....called a pile." My Bodom Picnic grill that I got from Kingsford University this year. 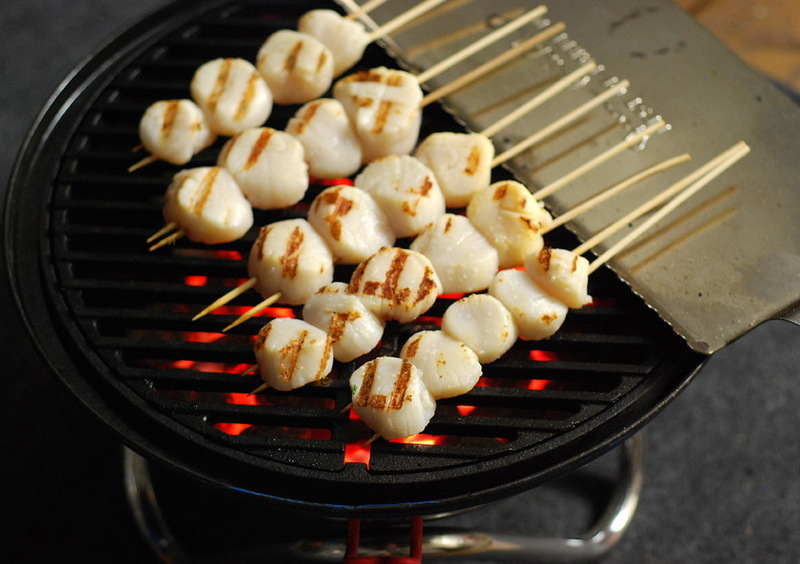 Scallops are delicate so you want to make sure your grates are thoroughly clean, preheated, and well oiled or seasoned. Otherwise, your scallops will definitely stick and tear. 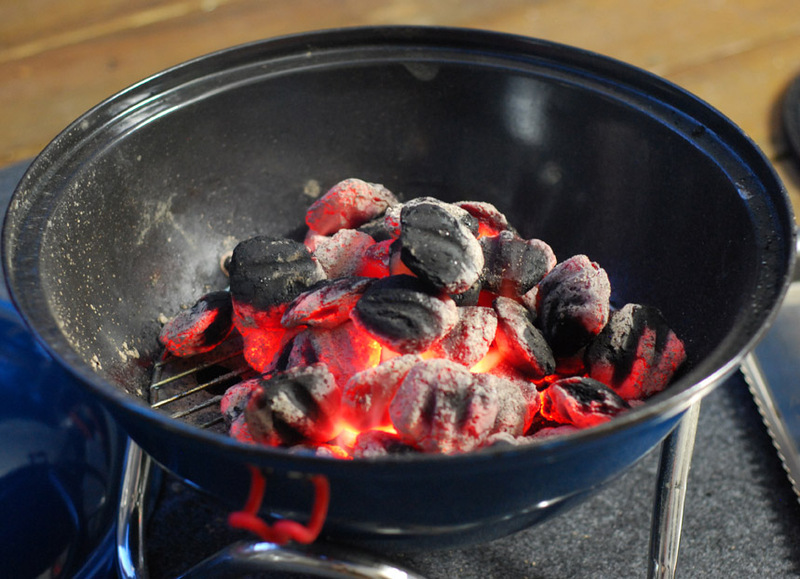 Here I'm using Craycort cast iron grates which are well seasoned. If you are using stainless or porcelain grates, moisten a towel with oil and rub it on the grates about a minute before grilling. I had the grates over the flame for a good 10-15 minutes before starting to cook. 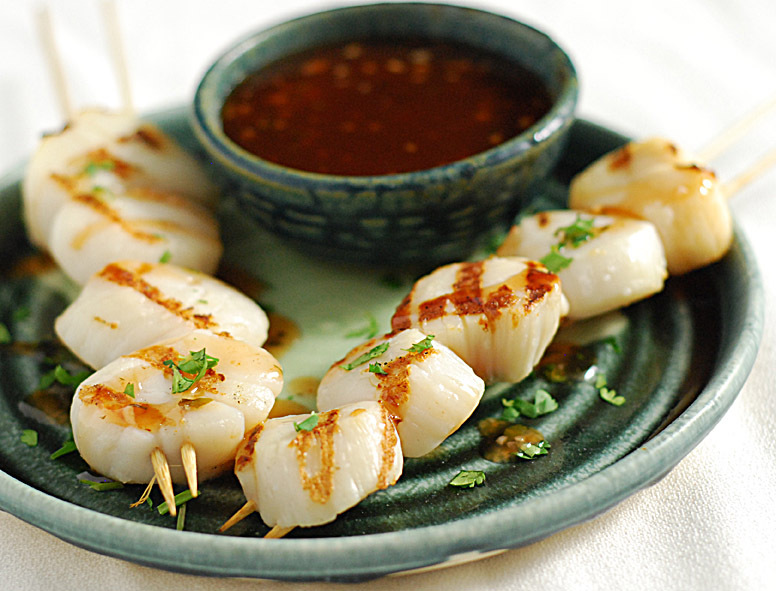 Place your scallops on skewers. I like to use the double skewer technique, this keeps the scallops from spinning when you flip them. Great for shrimp too. Season the scallops with a few pinches of sea salt. Grill over high heat for 2 minutes per side. 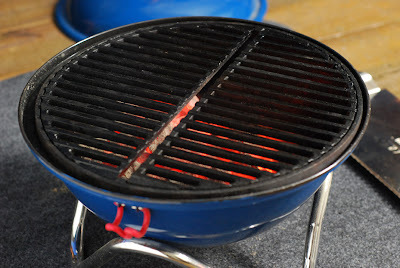 Stick tip: Use a heat shield like this to keep from burning your skewers. Garnish with cilantro and a drizzle of the chili sauce. Serve with extra dipping sauce. 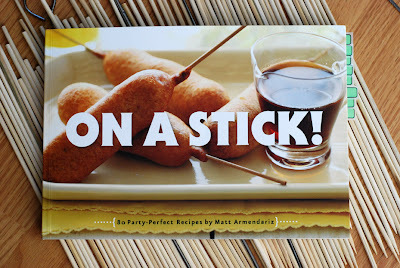 [Standard Disclosure] I received my review copy of On A Stick! from Quirk Books at no cost. The statements are all my own, I didn't even read the press release they sent with it.